Q: RABBIT BOSS, your first novel, was proclaimed by critics internationally to be a classic, ranking with ONE HUNDRED YEARS OF SOLITUDE and GRAPES OF WRATH. At one point you took RABBIT BOSS out of print, why such a drastic move? A: Looking back from this distance, the design of my actions has finally become evident. The construction of RABBIT BOSS as a novel did not deplete me but fulfilled me. I had not written myself out, but had written myself in, inward to a point where I barely existed as an individual. Q: So you took RABBIT BOSS out of print to write MILE ZERO? A: In a symbolic sense, yes. I felt I had to re-earn the right for my novels to exist, both the unwritten novels and the written. Q: You witnessed many seminal events of your generation, the first antiwar march in America involving Vietnam, the earliest days of the United Farm Workers Union struggle, dangerous civil disobedience actions during the civil rights movement, the counterculture of the 1960s in the Haight-Ashbury of San Francisco, the take-over of the town of Wounded Knee by the American Indian Movement, the violent student-teacher strike at San Francisco State University. Do you consider yourself a political writer? A: No. In many respects politics conspire against a novelist. As a matter of fact, in the late 1960s, I left America to pursue what was for me the ultimate revolutionary act, the full freedom of expression, the pursuit of total imagination, the creation of art. And that art for me was the novel; in my case it was RABBIT BOSS. American novelists have great privilege, privilege to create. With privilege comes obligation, obligation to exercise our freedom constructively, which does not preclude anarchy of the mind, even of the spirit, but it does preclude the most wanton waste of human existence I can imagine, apathy. Q: Over a span of twenty-five years you went from writing the epic RABBIT BOSS, about four generations of an Indian tribe in the California Sierra Nevada Mountains, to writing about Key West, an island smaller than the Miami airport, lying 90 miles off the coast of Cuba. Did Key west represent for you a place of "small actions" capable of swelling to "mighty events?" A: I had no intention of writing a novel in Key West when I first arrived there. At the time I was on my way to another island in the Caribbean, and stopping in Key West turned out to be fortuitous. I had not been able to write fiction for four years; I did have several hundred pages of notes and sketches for a novel set in California and Mexico, but while writing in both California and Mexico I was unable to match voices to my ideas. I had themes but no language. The trip to Key West placed me at the confluence of important events, the launching of the first Space Shuttle, at the same time boatloads of desperate Haitians fleeing the dictator Baby Doc were coming ashore in the Florida Keys, as well as ubiquitous loads of marijuana and cocaine were being confiscated by the Coast Guard. These events forged in my mind the foundation of a new American metaphor. I had physically transported myself 3,000 miles across the continent, into a geopolitical context of a transforming world. The key to unlocking that world necessitated undoing the cultural prejudices of my personal history: by that I mean the kind of "educated" American I had become, which had cost me for a time the ability to divine what is most crucial to a novelist-the character of the future that is reflected in the past. Q: You have referred to MILE ZERO as a "cosmic Cannery Row." What do you mean by that? A: As a boy I lived at the edge of the real Cannery Row in California. It was still physically as Steinbeck had described it in his novel of the same name, as if his words had built a real place. But over time that place fell prey to the commerce of modernity. The old sardine-packing houses were transformed into hotels and fancy boutiques, the ghostly quality disappeared beneath the thundering hordes searching for Steinbeck's people amongst an impossible charade. If you want to go to the real Cannery Row you must go to Steinbeck's book, there is the life. When I arrived in Key West I discovered haunting parallels with Cannery Row: the old wharves where men once set off to hunt shark, catch turtle, and harvest sponge were still there; so were many of the great stone cigar factories built by Cubans, all deserted but filled with ghostly consequences. If you knew where to look you could make contact with those distant times; if you kept your ears open you could discover the voices of those still living who were part of those enterprises now thought of as dead. Cannery Row died when the sardines mysteriously disappeared, never to rise again. Key West has died a thousand deaths, going from the richest city in America to the poorest. Key West died when the sponge blight came, it died when the Wreck Laws were changed, it died when the turtles were all slaughtered, it died after the lucrative slaves auctions were abolished, it died when the Navy abandoned its massive base, it died after Prohibition made rum smuggling less than profitable. But each cycle was a tide washing away the old, bearing seeds of the new, changing the status quo. The future, when I arrived in Key West, was overhead in the first Space Shuttle. The future was also boatloads of Cuban and Haitian refugees coming ashore. Q: RABBIT BOSS had an overpowering sense of place, the California Sierra Nevada Mountains. Your fictional vision in MILE ZERO seems to transcend place, Key West actually becoming a character in the novel. Was this your intention? A: MILE ZERO in the end is no more about Key West than DEATH IN VENICE is about Venice. Islands are about atmosphere, living at ease or at odds with the elements, land, water, air, wind. In RABBIT BOSS, it was my intention to build a landscape of language to convey the enormity of the Sierra Mountains and the profound history which played itself out there. In MILE ZERO the challenge was the opposite: instead of building a language I had to release a language, the sentences had to move naturally as if each were the breathing in and out of the air itself. How we use language determines how we perceive reality. In MILE ZERO Key West alchemizes into metaphor, but an ever changing metaphor. It is the end of the American road, but also the beginning of the American dream, it is the beginning of America if you are a refugee who lands there. The island is a human metaphor, but reality is that at any moment a hurricane can wipe the slate clean. It is precisely this awareness which MILE ZERO takes as its point of narrative departure. Q: In MILE Zero there is a relationship between the burned-out radical, St. Cloud, and the mysterious Vietnam vet, M.K., a gun and drug runner now in Central America. Did you base the St. Cloud character on your own experiences in the 1960s? A: ST. Cloud is not based on my experiences of the 60s but on the impact of the 60s. There is a popular and misconceived notion that a certain type of radicalism in the 1960s was feigned behavior, that the period was simply a faddish phase. It's true there was a spiritual disembowelment of my generation, for those who were politically aware, which was occasioned by America's involvement in Southeast Asia, but it's important to understand that the youth who protested the war in the beginning, when to do so branded one a Communist or worse, perceived not only that our military involvement in Vietnam was politically wrong, but that it would destroy the moral fiber of the country. In many ways, that was a very real consequence. 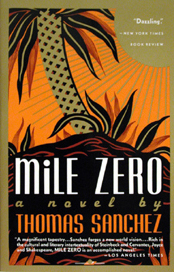 Q: MILE ZERO is a generational novel, the generation of the 1960s that matured in the 1980s. Is this also the story of your own coming to grips with this time? A: Absolutely, it was one of the reasons the novel took so long to write. Even though the psychological writing of MILE ZERO took ten years, I had wanted to write its major themes before I began RABBIT BOSS in the early 1960s, but I felt I wasn't capable yet to write about the spiritual core of the generation as I knew it truly to be. I was at the white hot center of that time, at San Francisco and Berkeley. It was a time of social tumult and cultural chaos, when youth mistrusted words. The novel was shouted down as a dead letter from the past, rock music and movies were being touted as the only vehicles of truth. I viewed from the mountain peak of my youthful idealism the desert looming ahead. I knew it would take me a generation to unravel my own generation, and that unraveling would have to be done with words, a new language in an old form, the novel. There is no future without past, the tradition of the novel is vital. It had taken me many years, harnessing the vitality, conquering the personal rage and frustration, measuring time in careful sentences, in order to reach a point where I could swing a moral moment around in the plot of MILE ZERO. Q: One of the major plots in MILE ZERO involves an exotic Voodoo-Santería murder, a crime which seems to haunt the conscience of Key West and has ramifications transcending the small island where the action is played out. The man who pursues the crime is an Afro-Cuban American cop, Justo Tamarindo. Was Justo someone you knew existed before the novel was begun? A: Justo was a gift. Without Justo I never would have made it through MILE ZERO. Justo knew everything there was to know about Key West, about Cuba, about men and women, family and individual honor, spiritualism and the spirit- he is probably the most moral man I have met, in or out of a book. Justo just winked and promised, when I was on the brink of all those pages thickening with action, "Follow me. I know the way out of here." And he did. Q: One last question: Key West, inch for inch, has probably been host to more writing talent than any other comparable piece of American real estate, from Jack London, Hart Crane, John Dos Passos, Robert Frost, Elizabeth Bishop, Wallace Stevens, Tennessee Williams, Ernest Hemingway, and on up to John Hersey, Peter Taylor, James Merrill, Richard Wilbur. Given all the words which have flowed over the years from Key West, you have identified one word above all to describe the island, contrabandista. What do you mean by it? A: Contrabandista is the operative word for the island; it touches upon both the legitimate and illegitimate heritage of Key West. Key West, in a deep sense, has often been a lawless Dodge City on the Gulf Stream. Islands by their natural circumstances are at once isolated and insular, such as writers often are, but at the same time islands are subject to the vagaries of great bodies of water surrounding them. Key West was, from its uncivilized beginning, an island of Pirates and Wreckers, surviving on the contraband of distant civilizations brought close at hand by the tides of fate and commerce which ruled the surrounding seas. From the rum runners of Prohibition days, to the scammers and smugglers of the space age, Key West has hummed along with its existential outlaw agenda, knowing that what the tide brings in can also be taken away. Laws change, rules shift, society is fickle, what is illegal one day is legal the next and illegal the following morning. In some ways, writers are the ultimate contrabandistas, forever searching for truth amid the vast armada of history sailing past on unpredictable and ever-changing currents. If a writer has a quick eye, thick hide, fast heart, he or she can make out quite well as a contrabandista.